Unlike other childhood favorites, the Teenage Mutant Ninja Turtles don’t quite hold the same sway over my early nostalgia. They never really stuck with me over time like Star Wars or even Transformers despite my frequent devouring of their various cartoons as a child. I recall the initial live-action movies even less, to the point where if I had even seen them, then it was so long ago I don’t remember anything about them (except Vanilla Ice… who is better left forgotten). 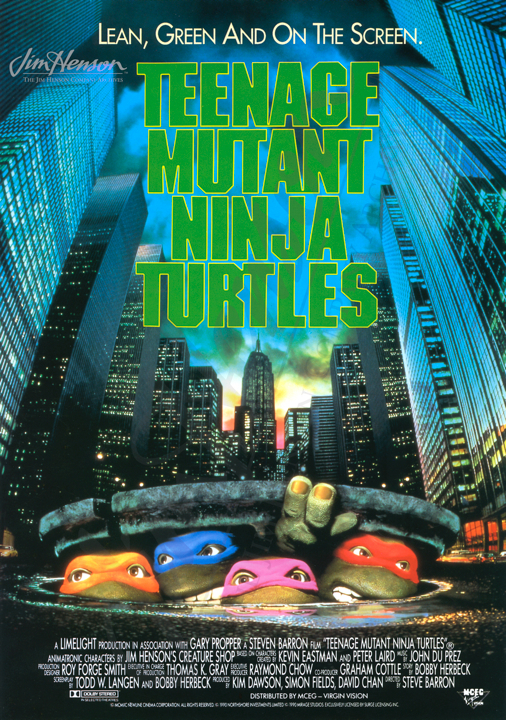 This, along with the current release of the new Ninja Turtles movie in theaters, prompted a revisit of the first live-action attempt from 1990 to see how it held up, if at all. Oddly enough, the aspect that holds up the most about Teenage Mutant Ninja Turtles: The Movie is the one most would expect to date the worst: the rubber Turtle suits. Even with their stiff moments, the Jim Henson-designed suits are more expressive than one would expect, and ably demonstrate how even warts-and-all practical effects stand the test of time better than many blue screen, optical, and/or CGI effects of the time (and even nowadays). A movie about the Ninja Turtles gains a lot of mileage by capturing the turtles and their brotherly banter even amidst the silliness of the premise, and it’s the reason why the franchise still endures today in many forms. 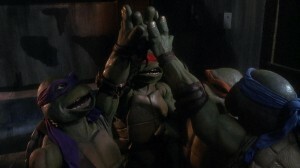 This is important, because even if you buy four turtles running around fighting with martial arts, there is still plenty of silliness around them that’s hard to avoid. Sometimes it’s better to just accept that they’re teenagers and ninjas, “just because.” It would have been a much better approach than the laughable origin flashback showing how the turtles and their master Splinter came to be. The cheese factor runs high, from the mannered acting to corny dialogue and scenes that simply make no sense at all. The movie is at its best when the tone plays things straight with just enough of a knowing wink, while the weakest moments occur when the tone skews too melodramatic or juvenile. In the context of a movie aimed at children, there’s an unexpected edge when it comes to establishing a city full of rampant crime, or as much as there can be in a movie with a hockey-playing vigilante (played by Elias Koteas!) and an army of ninjas ruled by someone named Shredder (complete with racial stereotypes!). Although it skimps on the satirical angle that defined the original comics, TMNT still retains a tinge of its grit amidst the cartoonish surroundings. Bringing the Ninja Turtles into the real world will probably never work as smoothly as they were on the comic pages and animation panels. It’s a concept that is just inherently suited to those mediums, and that is especially evident here when seeing the heroic quartet go into action, where the fight choreography is serviceable but never quite as fluid or thrilling as it should be. 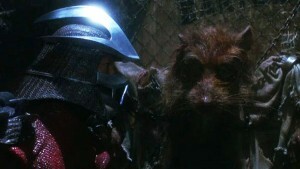 It may come as a backhanded compliment to say this is still the best Teenage Mutant Ninja Turtles movie, especially when the other choices are so varyingly woeful, but it also shows that putting in at least a little effort into unabashed product helps a good deal. Even junk food mostly fueled by decades of nostalgia can still retain its harmless charms. Previous ArticleTV Review: HBO's The Leftovers 1X07 "Solace for Tired Feet"
Next ArticleTV Review: The Strain 1x5 "Runaways"